This is not an airdrop so please stop putting your address since we are not going to send the free token. Do leasing 6 months in our node. All LocalWavesNode tokens to 0.2 Waves have already been sold. Thanks to all those who have trusted us. The next payment to the LocalWavesNode holders will be on February 3. Remember, now the Token is worth 0.21 Waves, hurry up to acquire them before they be bought!! We just made the payment to the holders of the LocalWavesNode Token. If you want to get the token that will give you rewards LIFETIME, get it in the Waves DEX. Next payment to the holders March 3. We just made the first eCredit week payment to our leasers! From now on all our leaser will receive 100 eCredit weekly until the end of stock. In addition, LocalWavesNode token and eCredit holders will receive monthly rewards. Next deliver on March 3. Like every week we have made the payment to our leasers. Remember to maintain your lease for 6 months to receive LocalWavesNode Token and receive LIFETIME rewards. 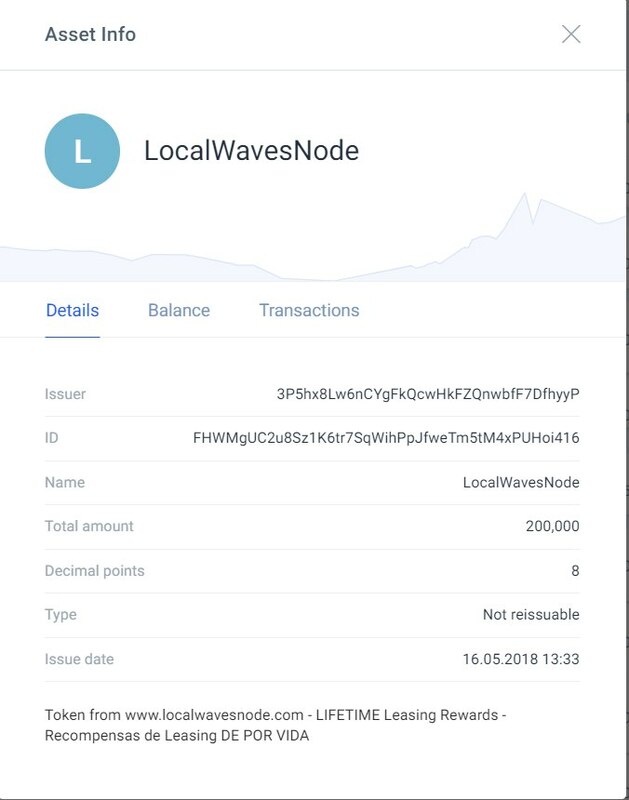 Another month, we have done the payment to the holders of the LocalWavesNode token. If you want to make this token that will give you a percentage of what our node mine monthly you only have to do leasing with us or buy it in the Waves DEX.